As I think of the New Year that’s almost here, I pray that you all set new and amazing goals. Keep climbing! You know 2016 is over once (the holiday formally known as) Thanksgiving hits. I can't help but be thankful for the blessings in my life: watching my niece get a perfect score on her spelling test for the 6th time, graduating my first cohort of students at the life skills and job training program I work for, finishing a song with the great folk at JahRock'n Productions, the upcoming events I'll be performing at, and reflecting on the past. Man, I'm blessed, and I know 2017 will be even more amazing. NYC, check out these events, one of which will be streamed live on Facebook for my non-New Yorkers. Also, check out some videos you may have missed. This Saturday, I'll be performing at the 6h Annual African Diaspora Awards, a special initiative that aims to celebrate exemplary individuals who have made a significant difference in the African community in the United States. This black tie event will be hosted by African comedian/Instagram sensation Dulo (@IamDulo) and will be honoring some amazing movers and shakers in the community. Oh, and with the promo code "ADA2016" you can get 30% off your ticket! Performing a poem of my own and one from my favorite woman writer of Color on Thursday, Dec 8th @ 7pm at the #DECOLONIZETHISPLACE gallery in downtown Manhattan. Hosted by The Women Writers of Color Group & Reading Room. This event will also be available via Facebook live. It is free and for the people. We ask that you bring coats and/or offer a donation to the shelters we'll be supporting. Hosted by Mahogany L. Browne, and also featuring Lynn Procope, Crystal Valentine, Venessa Marcos and more. Thank you for being a friend. Keep in touch on social media! If you missed it, you missed a lot! On Wednesday, May 15th at Negril Village Lounge, a gathering of people came out to celebrate the release of my new album AIM HIGH. I was not able to get photos with some of the awesome people there like my friend & amazing emcee Homeboy Sandman (aka Angel!!! ), my mentor and A&R for the album Steven "PeeJay" Whitaker, my sister Suzanne, Alonzo Davis from www.JustBeenTested.com, and more great people who showed love. Thank you to everyone that supported the album, who spread the word, who asked me "Yoooo when does the new album come out" over and over, and to all those who weren't able to make it (or didn't even hear about the event), I thank you for caring and always showing love. PLEASE cop the album if you already haven't and spread the word! People were able to get AIM HIGH CDs signed, hear me perform, and listen to a few tracks from the album! DJ Commish and DJ Jon Quick, the two who made the night possible and who kept the tunes spinning and the people dancing all night long! Singing "Aim High"... See the passion????!! My cousin Kieuna and my stylist, Quanasia! L.I.V.EWire (who performs with me later and KILLS it on the Aim High Remix) & the amazing vocalist and beautiful person, Cocoa Sarai. My girls here: Aura, Tiffany, and Jessica holding me down! The brotha with the soulful voice, Bradd Marquis, who stopped through RIGHT before his show at S.O.B.'s. That's love! Skee-Wee, my Soror! Model and actress Krystal Garner showed love. Skee- Roo to DJ Jon Quick! 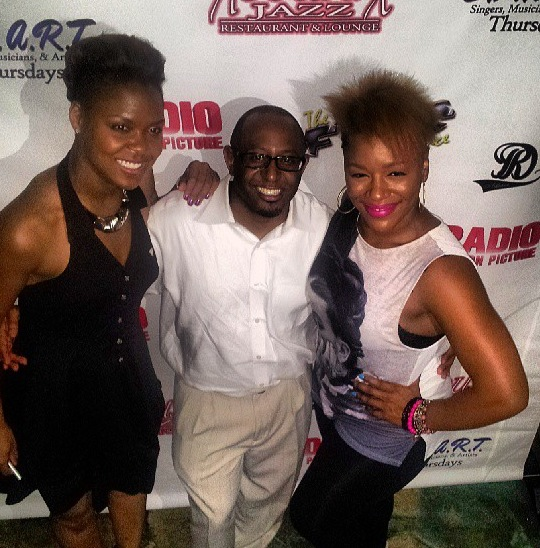 East New York neighbor, Radio Personality, and DJ OhSoKool all smiles! Behold all things are made new..
January is all about planning for February and beyond. Glad to get back on task after the insanity of the last few months. Thank you for all the prayers, condolences, and positive energy many of you sent regarding the loss of my mother and brother-in-law. I appreciate all of you and thank you for your love & support. MUAH! For a complete list of dates, go to my Calendar. Hope to see you soon! And if you want to book me, drop me a line at info@shanellegabriel.com. I've been in the JahRock'n Productions studio ALL week getting this new album wrapped. AIM HIGH is going to be an AMAZING project. The next few months are going to be intense, but I'm really looking forward to sharing my stories, my poetry, my music, my lyrics with you. This album features some dope friends of mine: Kel Spencer, Livewire, Heesun Lee, and GreyMatter, all dope artists that rep NYC as well as the awesome Willie Hyn who's holds it down in Atlanta and a cameo from YouTube star/ comedian/ poet SpokenReasons. Production by Chris "Theory" Bradley, DJ Static, Marshall "Soulful" Jones, and Team JahRock'n. I can't wait to let you all hear it! Here's a poem I created for my father. I'm a bonafied Daddy's Girl, and proud of it. Thought I'd share my first off-book live performance I did at ATL's Urban Grind last month. Shanelle tells HooplaHa her story of embracing the obstacles that were thrown at her, so she could use them as stepping stones to climb higher to her dreams. She is inspiring others to value their health and their life. You know the feeling you get when someone randomly shares something with you that is just so TIMELY, so PERFECT, so NECESSARY at the moment you hear it that it brings you to tears??? I got that after my boy Kel Spencer sent me this... Dopeness! Reminiscing on crushes and past loves in a funny, comical way. Spoken word and a little bit of melody!